Last week the National Center for Health Statistics announced that U.S. life expectancy had fallen slightly in 2008 to 77.8 years, versus 77.9 years in 2007. Clearly this decline was related to the recession, in some way. Nevertheless, it struck me as odd that in the same year life expectancy declined, employment in the private healthcare sector rose by 2.7%, faster than the 10-year average growth rate. That observation made me think (again) about putting together a simple analysis of healthcare productivity. I understand quite well that this is a quixotic venture, since productivity is defined as output per worker and no one can agree on how to measure the output of the healthcare sector is. But I’m going to take it step by step, for transparency. Everyone is welcome to lob tomatoes, as desired. Let’s start from the beginning. We don’t have a good measure of the output of the healthcare sector. However, population size is clearly related in some way to healthcare output (for a given level of ‘health’, we’d expect the output of the healthcare sector to rise with the population, holding demographic and income composition constant). So here’s our first step. The chart below compares the 10-year employment growth in private health care services with overall population growth, and with growth of the 65-and-over population. If productivity in the healthcare sector was rising, and the “health output” per American, however defined, was constant, then we would expect healthcare employment to rise slower than the population. But in fact, you can see that healthcare employment increased much more than the overall population from 1998 to 2008. (26% vs 10%). FYI, the same was true during the recession–from 2007 to 2010, healthcare employment rose by about 6%, while the population rose by slightly less than 3%). More important, the increase in healthcare employment also far outstripped the increase in older Americans (a 12% gain). That means the big growth in healthcare employment cannot be due to the aging of the population. So in fact, we’ve already learned something. The rapid increase in healthcare workers per capita is by itself a key reason for rising healthcare costs–separate from the cost of new drugs, the capital expense for new technology, and the aging of the population. I would go further. Civilization has moved forward because of innovations that cut costs and extended capabilities simultaneously. The current structure of healthcare seems to be producing ‘innovations’ that raise costs and don’t actually increase life expectancy. I think that the main goal of healthcare reform should be to extend coverage and give more incentives for innovations that actually cut costs while producing better results. Is the U.S. Overweight on Health R&D? Let me continue my previous post on the R&D priorities of the U.S.government. When it comes to government spending on health R&D, the U.S. just blows away the rest of the world (those are the blue bars. The data is from 2008 for all the countries, except for 2006 for Korea and 2005 for the UK). But surprisingly, when it comes to government spending on nonhealth civilian R&D, the U.S. is actually lagging other major countries. It appears that to some degree, we have gambled our economy on the success of life sciences innovation. Note: This data comes from the OECD, so it’s slightly different than the U.S. budget data from the earlier post. We spend a lot of time and money protecting our kids from accidents–everything from car seats to picking them up by car from a friend’s hose, rather than letting them walk home alone. Does all this monitoring and spending work? a) about the same as today’s death rate. c) 15, or triple today’s death rate. d) 19, or more than triple today’s death rate. 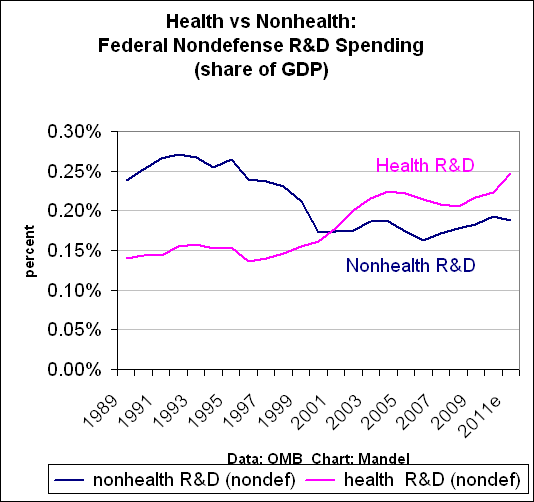 The Obama budget continues the trend of the Bush years–a rising share of GDP going for health R&D, while federal nonhealth nondefense R&D is basically flat as a share of GDP. Nonhealth R&D includes space, energy, environment, information technology, physics, chemistry, and pretty much the whole range of science and technologies, outside of the life sciences. 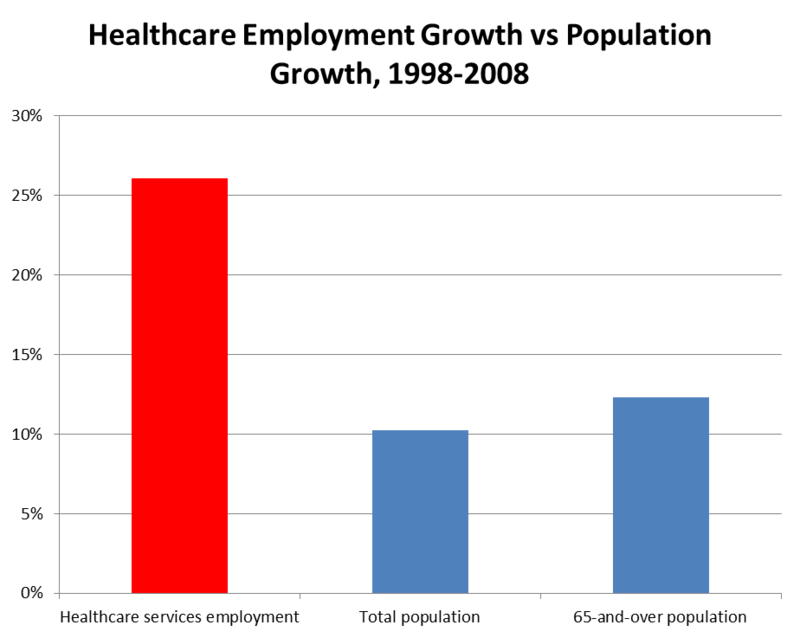 Since FY 2001, funding for health R&D has exceeded funding for nonhealth nondefense R&D, and the gap has been growing. 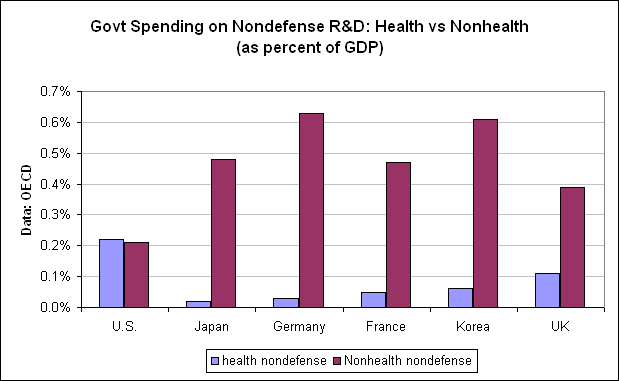 The President’s proposed budget for 2011 calls for nondefense health R&D to exceed nondefense nonhealth R&D by 31%. Given that the Obama Administration has made green technologies a priority, it’s worth looking at federal funding for potentially ‘green’ R&D: Transportation, energy, natural resources, and environment. This chart shows federal nondefense R&D spending in these key areas, as a share of GDP. Certainly it’s on an uptick compared to the 2006-2008 lows. 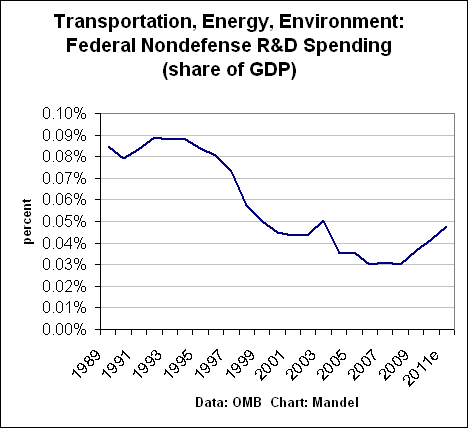 But even then, the 2011 level of funding for transportation/energy/environment R&D, measured as a share of GDP, is roughly half where it was in 1992. If you believe that the U.S. is falling behind in nonhealth science and technology, these charts suggest one reason why. I haven’t written much about healthcare reform over the past year, mainly because the public debate has been all about money: How do we pay for extending coverage, how do we reduce the costs, how do we change reimbursements, how do we save the country from going broke, yada yada yada…. But here’s where Obama and company have made their big mistake. They thought that the big problem with the healthcare system was money. And it’s true, people whine about the cost of healthcare. But in the end, it’s not about the money.The big problem with the healthcare system is that it doesn’t produce enough results for most Americans. Let’s take a look at a few charts, shall we? Here’s the first one, the death rate per 100,000 for Americans aged 45-54. These are the prime years when people are working, raising kids, and generally at their peak in terms of contributing to society. But they are also the years when we all start feeling the first whiff of mortality–cancer, heart disease, and all sorts of other ills. Speaking for this age group (after all, I’m 52), we want a health care system that addresses these potentially fatal ills. Uh oh. What do we see? 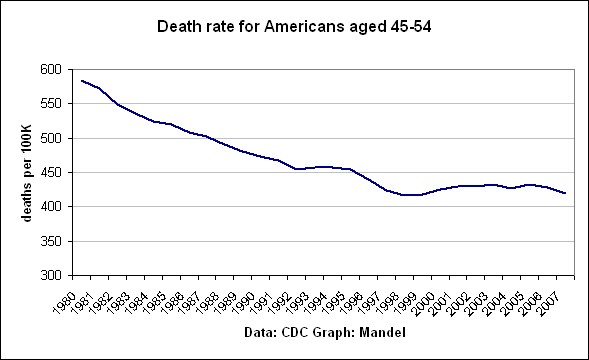 The death rate for us 45-54 year olds hasn’t budged much since the late 1990s. In 2007, the latest year published, the death rate for 45-54 year olds was 419.9, actually up from 418.2 in 1999. That’s a big change from the previous two decades, when the death rate has plunged. We see no sign in this chart that all of the hundreds of billions of dollars in health care research, and the trillions of dollars in health care spending, are actually paying off. Yes, it’s possible that the health care system is simply struggling to keep up with external factors such as Americans are getting heavier and a possibly deteriorating environment. But now take a look at this chart. 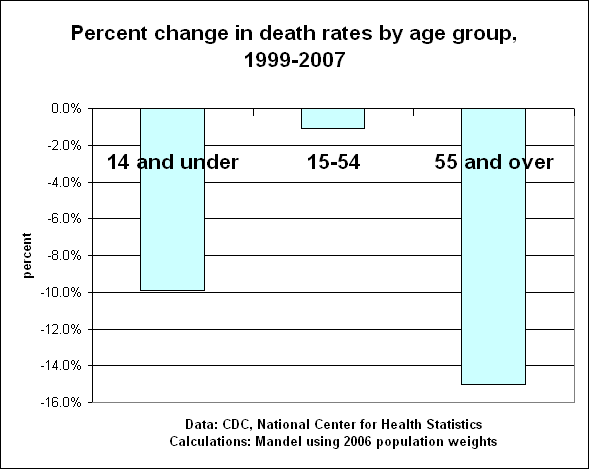 This chart reports the percentage change in the death rate for three broad age groups–14 and under, 15-54, and 55 and over. What we see is that older Americans have seen a very rapid improvement in their odds of dying since the late 1990s. Younger Americans are also less likely to die. But what about us in the middle? We 15-54ers saw only a 1% decline in our death rates over this period. Not good. Not good at all. Where’s the bang for the buck? (Technical note: I started with 1999 because I was sure I could get a consistent series over that stretch…the numbers don’t change much with a 1998 start date. I used 2006 population weights to combine groups). Finally, here’s one more chart. 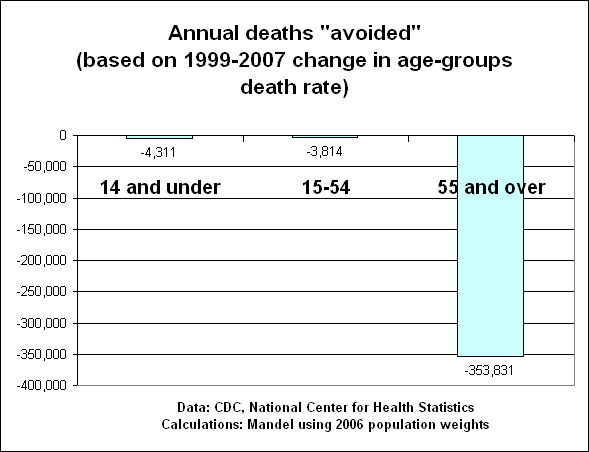 Given the change in the death rate between 1999 and 2007, how many deaths per year were “avoided” in each age group? That is, how many fewer people died in one year because death rates were at 2007 levels rather than 1999 levels? There’s quite a few ways to do this calculation, but I used the 2006 population as my reference point. Here’s what I got. In the 14 and under category, the 1999-2007 change in death rates would translate into about 4000 fewer people dying per year. Similarly, in the 15-54 age group, the 1999-2007 change in death rates would translate into about 4000 fewer people dying per year in that age range. The big impact comes from older Americans, with roughly a 350,000 estimated drop in deaths (please treat these as rough estimates..like I said, there are multiple ways to do these calculations). So let’s summarize. For the people aged 15-54, who make up more than half the population, the health gains have been meager since the late 1990s. Why? I’ll get to that in a future post, but let’s just note for now that many of the health research initiatives which seemed so promising a decade ago have gotten bogged down. For example, cancer death rates have fallen, but the war on cancer has turned into a long-term battle, with some progress but not nearly enough (I’ll get to this more in the next post). Let’s also note that this stagnation in healthcare outcomes for a big chunk of the population has occurred over the same period that national health care spending roughly doubled (in nominal dollars) . So did the NIH budget. And healthcare employment rose by roughly one-third. The Obama legislation assumed that healthcare outcomes were fine, and all we had to do was broaden coverage and (perhaps) reduce costs. But if you want to do something that benefits the great majority of Americans who already have health insurance coverage, you have to do something to improve healthcare outcomes. The first goal of any healthcare reform legislation should be to improve health, for everyone. At the lowest marginal cost, for sure, but it’s never going to be acceptable, politically or morally, to go backwards.